Ferry Beach is a non-profit Retreat & Conference Center located on a 32-acre beachfront property in Saco, Maine. Our mission is to awaken hearts to explore, grow, and renew the spirit of universal love. We accomplish our mission through activities in Social Justice & Action, Personal Growth, Care for the Earth, Spirituality, Education and the Arts & Culture. We know that as a non-profit organization, you care about the people you serve and the world we live in - just like we do! We want to share our work and vision with organizations that are similarly aligned within the southern Maine area. We hope to learn about the work your organization is committed to and find ways to partner with similar groups. 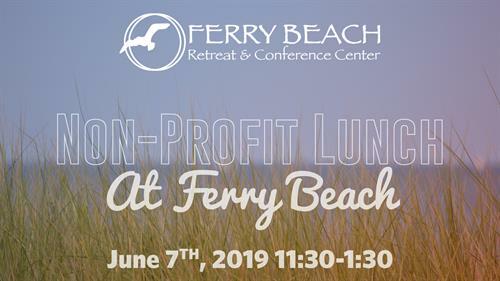 On Friday, June 7, 2019, from 11:30-1:30 Ferry Beach will host our non-profit friends & neighbors to enjoy a free meal, explore our beautiful facility, and network with area non-profit organizations & leaders. We have room for 150 to attend, so be sure to sign up early! Admission is free for Executive Directors, Staff Members and Board Members of 501(c)3 organizations.